A bleak debut for Sarwa Capital’s stock would have been bad enough but it may also be an omen for Egypt’s plans to raise over 100 billion Egyptian pounds ($6 billion) in its state divestment drive. The private investment firm plunged as much as 18.5 percent in debut trading, despite the hype surrounding its initial public offering which raised about 2.2 billion pounds. Sarwa recouped some losses on Monday, but resumed its slide the following day on concern over the IPO pricing. It closed up 0.3 percent on Tuesday. With the volatility in global equity markets derailing IPOs from Spain to Hong Kong, the Egyptian government now faces an uphill battle if it moves ahead with plans to offer stakes in over 20 state-run firms. The first sale could come within 10 days. 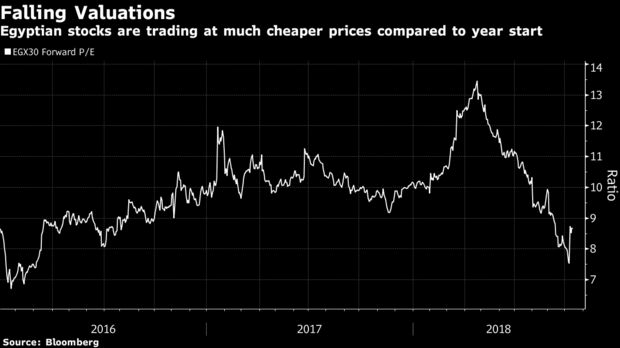 Delaying the program that has the full backing of President Abdel-Fattah El-Sisi runs the risk of sending the wrong signal to investors at a key time. Turmoil across emerging nations has caught Egypt in the midst of a sweeping economic overhaul, even as it grapples with weaker foreign appetite for its debt. The government is looking to sell shares in four to five companies already this year in an effort to streamline the bloated public sector and turn around loss-making state enterprises. It’s an extension of a broader economic reform program that started in November 2016 with the lifting of currency controls. Given the unfavorable outlook and losses in Egypt’s benchmark stock index, even some officials are lowering expectations. Public Enterprise Minister Hisham Tawfik is expected to hold meetings to pick a final date for the sale of an additional 4.5 percent stake in state-run monopoly Eastern Tobacco, Al-Borsa newspaper reported Tuesday. He had earlier set the time for Oct. 21-25. The talks involve investment bank EFG-Hermes, which is overseeing the IPOs, as well as other officials. In comments earlier this month reported by Youm7 newspaper, Tawfik warned bluntly that “the government will lose with the price at which it will offer” the stake. Sarwa’s flop was a surprise after a recent IPO by Cairo Investment and Real Estate Development Co. saw its shares surge over 17 percent. Earlier equity sales this year also fared better. The plunge in Sarwa’s shares was in sharp contrast with the interest among investors in the offering by the consumer and structured-finance provider. Its private placement was oversubscribed almost 11 times. The performance is “a complete surprise, contrary to the level of subscription and demand that was supposedly received by the IPO,” said Allen Sandeep, director of research at Naeem Brokerage. Looking more broadly, “our view is that larger-ticket IPOs, from the private side, as well as the government side, could get pushed to the beginning of 2019,” he said.